A walk with so many options. This is a hill though low in height is of considerable bulk covering some 15km sq. 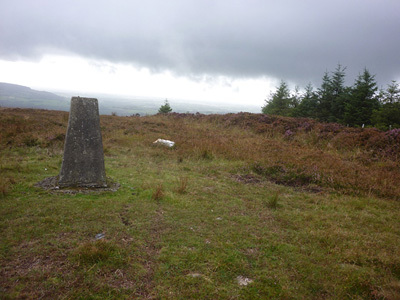 It is also a hill that is serviced by three National looped walks and the Wicklow Way all of which open up opportunities for walks of varying length and intensity. The three loops are Mangan's (9km), Ballycumber (14km) and Kyle 20km) and all start near Tinahely but can be joined at various points around the hill (as in my case) and linked together to suit a walker's interest or time available. All three routes, while not crossing the high point of the hill, pass close to it thereby making its inclusion available for very little extra effort. Routes are downloadable from the National Looped Walks web-site.